Know the important diseases that can occur on your farm, be able to recognise symptoms and adopt preventative strategies rather than relying on treatments to suppress disease. Integrate management and chemical treatments to optimise production; minimise residues; reduce animal health costs; and reduce the development of chemical resistance. Drench resistance is a major problem in all areas where gastrointestinal parasites occur. Whilst it is the inevitable outcome of using worm drenches, strategies can be adopted to slow the development of resistance. Management changes may reduce the risk of disease. In such cases, the underlying program may be changed, for example, to reduce frequency or eliminate treatment. Alternatively, changing flock structure may increase the risk of parasitic disease, and so require more intensive monitoring. If you are unsure, consult your veterinary practitioner, sheep health consultant, or State Department of Agriculture/ Primary Industries adviser to determine the likely disease status of your property. Local knowledge from other sheep producers can also help. Ovine Johne’s disease (see tools 11.13, 11.14, 11.15 and 11.16). Use an integrated parasite management approach. Trigger points are particularly relevant when seasonal conditions are ideal for the development of disease or, alternatively, when drought conditions reduce the necessity for normal strategic treatments. Develop a health monitoring plan that includes trigger points for action, such as a reduction in condition score, WEC above drench threshold, obvious signs of ill health or parasite infestation (e.g. rubbing sheep). 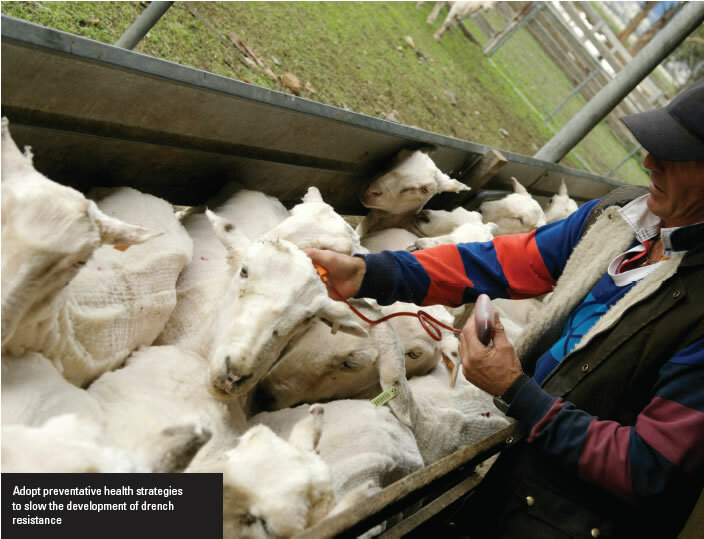 Assessing the economic cost of endemic disease on the profitability of Australian beef cattle and sheep producers – to download this technical report click here. Worm control in southern prime lamb production systems. MLA fact sheet. Click here to download. Animal Health - Go to the Department of Primary Industry’s website in your state and look under Animal Health.